Local Advocacy Opportunities in Your Hometown! Rare disease patients find out soon after a diagnosis that they’ll have to learn advocate for themselves- in the doctors office, to insurance companies, and even to the government. Unfortunately, rare diseases are still often overlooked in legislation, even though it’s estimated that 1 in 10 Americans lives with a rare disease. That’s where organizations like Rare Disease Legislative Advocates (RDLA) comes in. They help connect patients, rare disease organizations, and legislators to spread awareness of rare diseases among the policymakers in our country who can help affect positive change. 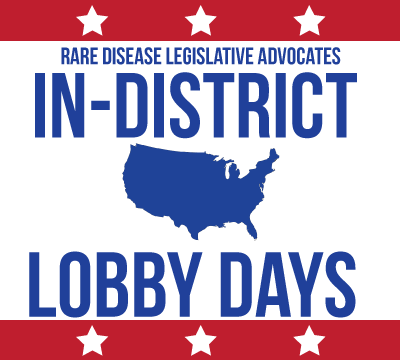 RDLA is organizing their annual “In-District Lobby Days” this year, between July 31st and September 1st. During this time, Senators and Representatives are in their Summer recess and will be in the districts they serve in their respective states. RDLA is offering to schedule meetings on behalf of rare disease advocates who want to meet with their local representatives during this time. They will provide helpful background information on current advocacy efforts on the part of the rare disease community, and participants can also attend an online webinar to help them prepare for their meetings. This opportunity is good for both well-seasoned advocates as well as those who are just dipping their toes into the world of rare disease advocacy. If you’re interested in trying your hand at advocating on a local level, this is your chance. Registration for this year’s RDLA In-District Lobby Days ends July 20th. Sign up now!